Image by Tim Davis, Consolidated Photo. 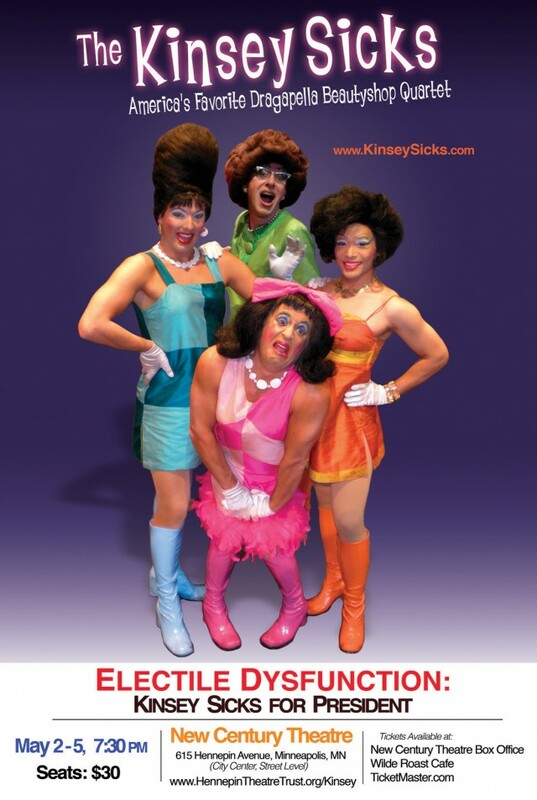 San Francisco is Ground Zero for queer culture and since the early ’90s the over the top ‘Dragapella Beauty Shop Quartet’, The Kinsey Sicks, have been Bay Area luminaries. The foursome who have appeared Off-Broadway and played Vegas actually first performed publicly on a Castro Street corner in 1994. The year before that they were simply four professional men who attended a Bette Midler concert in San Francisco and were actually the only drag queens there, believe it or not! At that fateful event the four were approached to sing for an upcoming event, so that very night they began vocalizing together, realized they had something special, and the rest is drag entertainment history. Original founding members include Ben Schatz (Rachel) and Irwin Keller (Winnie). Schatz, former director of the National Gay and Lesbian Medical Association created the first national AIDS legal project and authored President Clinton’s HIV policy during the 1992 presidential campaign. Keller, a lawyer, a linguist, and former director of the AIDS Legal Referral Panel of the San Francisco Bay Area, authored Chicago’s gay rights ordinance passed into law in 1989. In ’04 Jeff Manabat joined as Trixie and in ’08, Kansas City’s Spencer Brown jumped on as Trampolina. In ’05 The Kinsey Sicks got three OUTmusic Award nominations. In ’08 they were nominated for Outstanding Comic Group by The Manhattan Association of Clubs & Cabarets. In the same year they got an Independent Reviewers of New England Nomination for Best Visiting Production for Wake the F@#k Up America. That title tells you The Kinsey Sicks relish political satire. Other show titles include I Wanna Be A Republican and Condolezzapalooza. Better yet, Rachel asserts “we believe we are uniquely qualified to be the next Republican President of the United States.” Hence, their current offering at the New Century. New Century Theatre, 615 Hennepin Av., Mpls.